Take a bowl. Add spinach puree, mashed potatoes, ginger-garlic paste, green chillies, pepper, salt and mix it well. Add maida and mix it well and knead the mix like soft dough. Grease your hands with oil and make small tikkis. Take microwave safe tray/dish. Grease the tray and sprinkle some flour on it. Preheat oven and bake the roll in Microwave+Grill combo at 300W+Grill for 8 minutes or till it turns light brown. For serving, arrange tikkis on the plate. Put some vegetables on it, topping with tomato sauce. Serve it immediately. 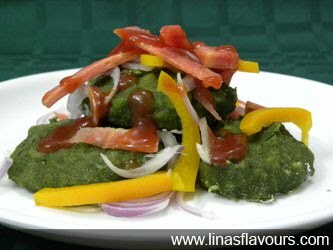 Other option is frying the spinach tikkis if you like it that way. You can even add shredded cabbage.